Tory environmental policy is myopic, geared towards a marginal elite, plundering natural resources and breeding inequality, Labour leadership contender Jeremy Corbyn has said. In a scathing attack on Conservative Party policy, Corbyn said a minority in Britain have benefited through exploiting the environment and human capital in a deeply unsustainable way. The Labour MP, who has sent shockwaves through the party’s establishment ranks since joining its leadership race, made the remarks at campaign event on Friday morning. Corbyn said social justice must form the bedrock of any strategy for tackling climate change if humanity is to salvage its environment, and build an inclusive society free from social exclusion and poverty. He unveiled a number of proposals for building a green economy at Camley Street Nature Reserve in North London. The Labour leadership contender was joined by respected environmentalist and ex-Labour MP Alan Simpson, green energy advocates, and others. Corbyn said the global climate crisis has come to Britain’s doorstep, and is affecting some of the nation’s most vulnerable people. He pledged to scrap short-term, environmentally destructive policies which breed inequality and instead move to democratize Britain’s economy. The Labour MP said this path of sustainable development would respect the earth’s finite resources, while building a more productive economy and just society. 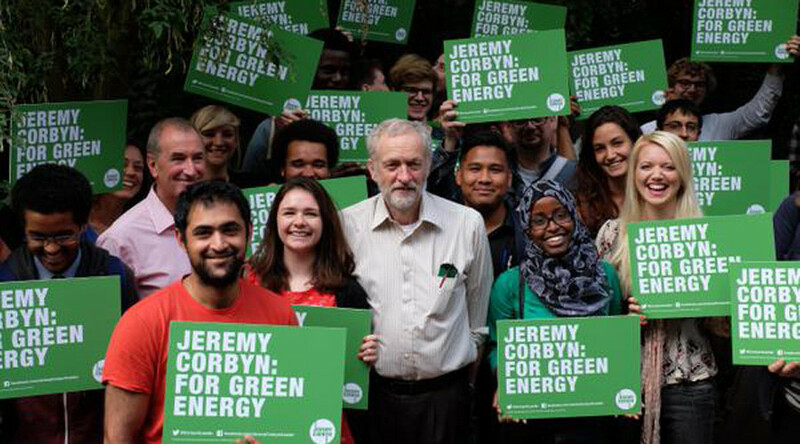 Central to Corbyn’s vision for a green economy are a number of key policy proposals. The Labour leadership hopeful said he would nationalize Britain’s energy supply, paving the way for an end to the state’s fossil fuel era. He also vowed to cultivate a “modern, resource-efficient economy,” which he said would create one million new energy jobs. With an estimated six million households in Britain struggling to meet the cost of energy bills, Corbyn pledged universal access to low-carbon homes that are affordable to heat. He also vowed to address Britain’s air pollution crisis, particularly across the state’s urban centers. Corbyn said he would push for an independent inquiry into Britain’s air quality, and would follow globally-agreed regulatory standards for curbing carbon emissions and pollution. “It’s an attitude of mind that we have to deal with,” he said. The Labour leadership contender argued fracking and shale gas drilling are regressive, environmentally destructive and should be opposed. “It’s a state of mind whether you believe there are finite resources in the world,” he said. Alan Simpson, who served as Labour MP for Nottingham South for 18 years, said Britain’s energy framework is run by “a corrupt cartel.” He stressed concrete solutions to a complex climate crisis are paramount. Simpson said Britain must follow the lead of German and Californian policy-makers, who are legislating to cut carbon emissions and build productive, green economies. Corbyn agreed with this analysis, saying Britain must opt for sustainable forms of renewable energy, and phase out nuclear energy.